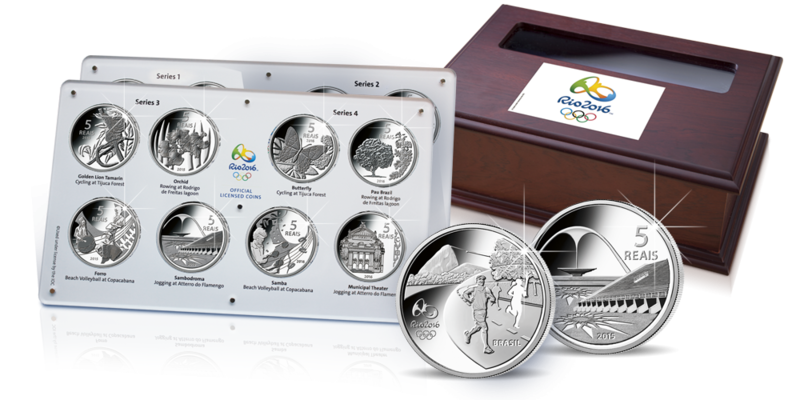 VIP set of 16 silver commemorative coins Rio 2016! This year saw Britain's most successful Olympic games ever! For the first time in the history of the Olympic Games - the world's biggest sporting event - was held in Brazil. This VIP set is one of only for 350 available to selected collectors around the world! According to Olympic tradition, the organiser of the Olympic Games, Brazil, prepared a commemorative coin program. This VIP set is the final piece of the jigsaw. In 2014 a small number of each silver coin Rio 2016 was reserved with one specific purpose: to develop a complete coin set of the 16 most prestigious silver Rio coins in 2016, for real collectors. These are available exclusively to the UK market from The London Mint Office on a strictly "first come first served" basis! The Exclusive VIP 16 Coin Proof Set Costs only £1,495. Is this for you? Then why not speak to one of our experienced experts on how we can help make this set work for your collection.